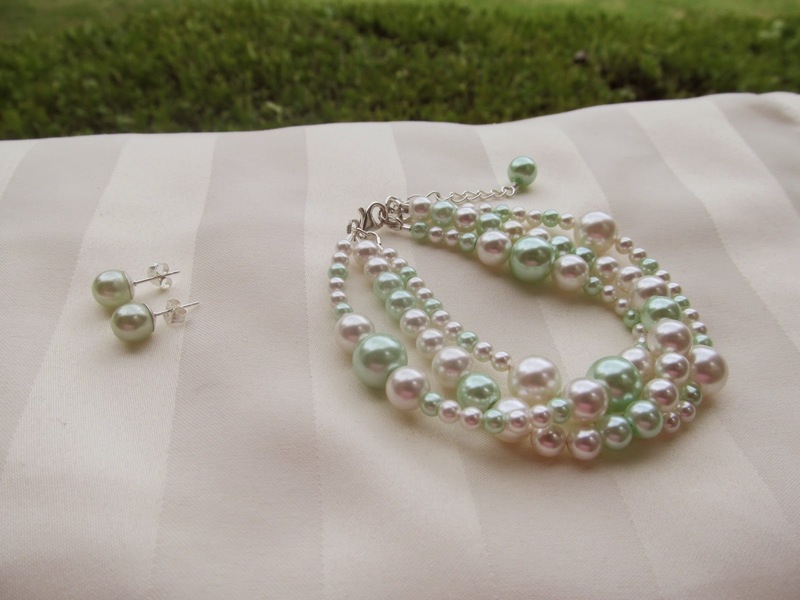 Well Shayla's mom, Kris Schmitz, contacted me this year and said that her other daughter, Shanna, is now getting married, and asked if I would create the wedding jewelry for her bridal party. 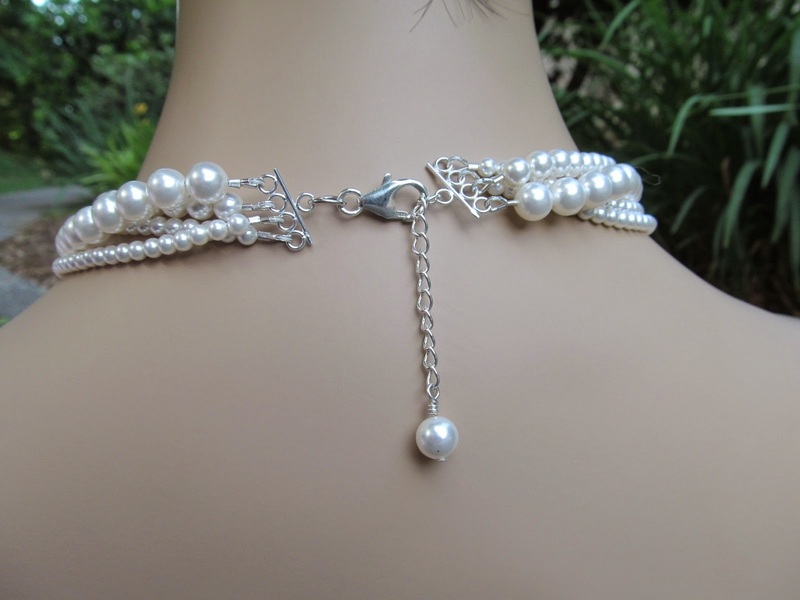 I gladly accepted!! 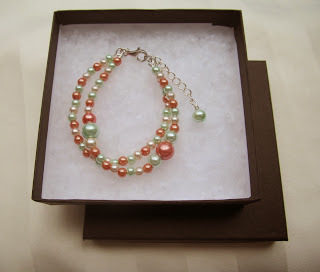 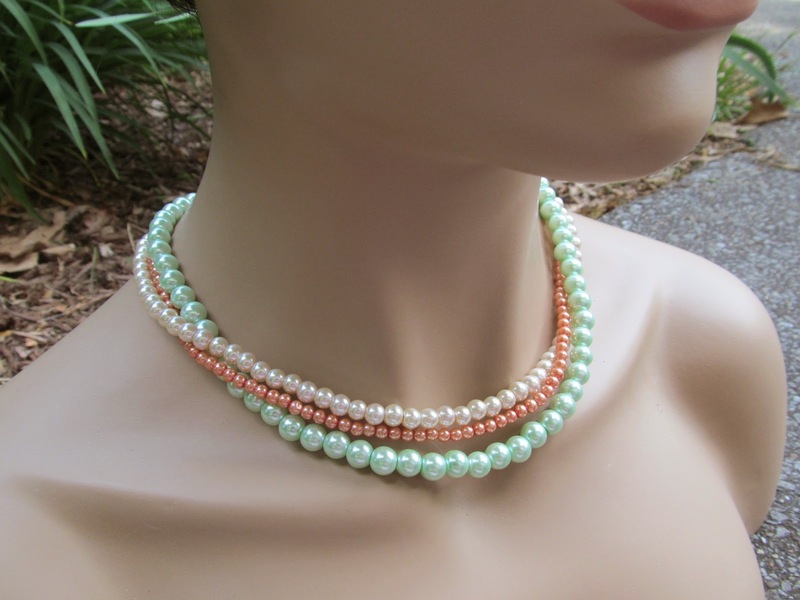 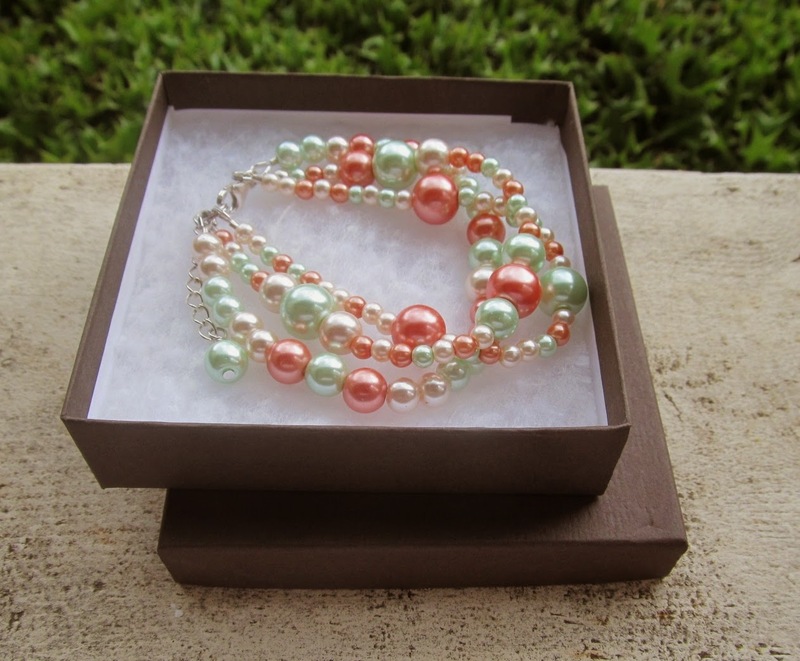 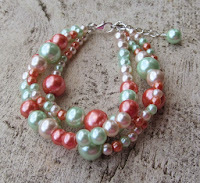 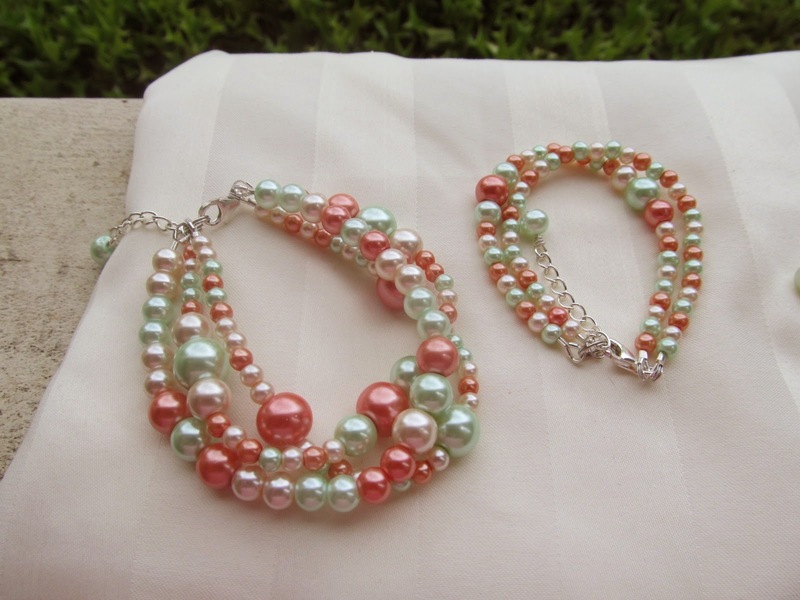 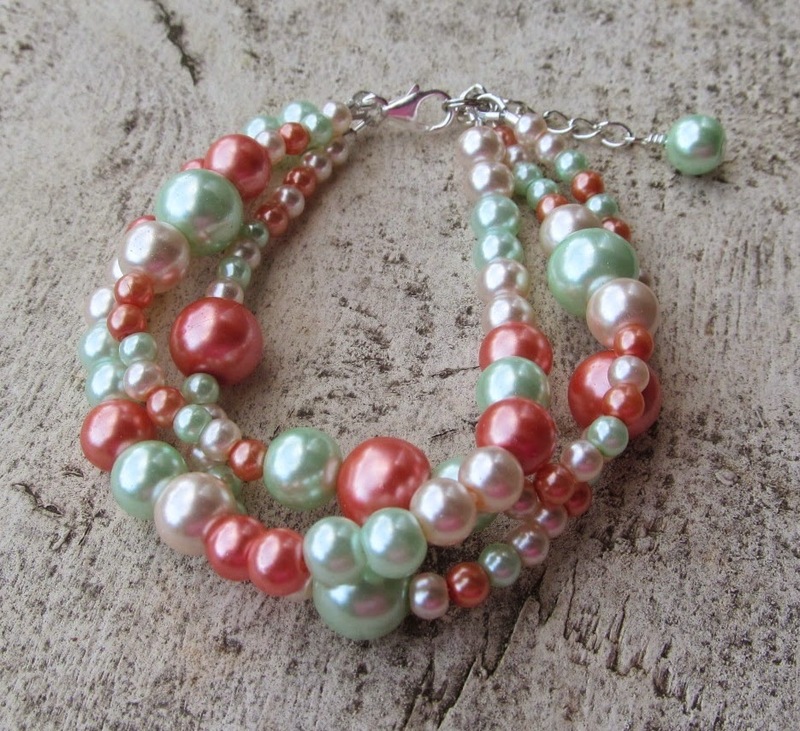 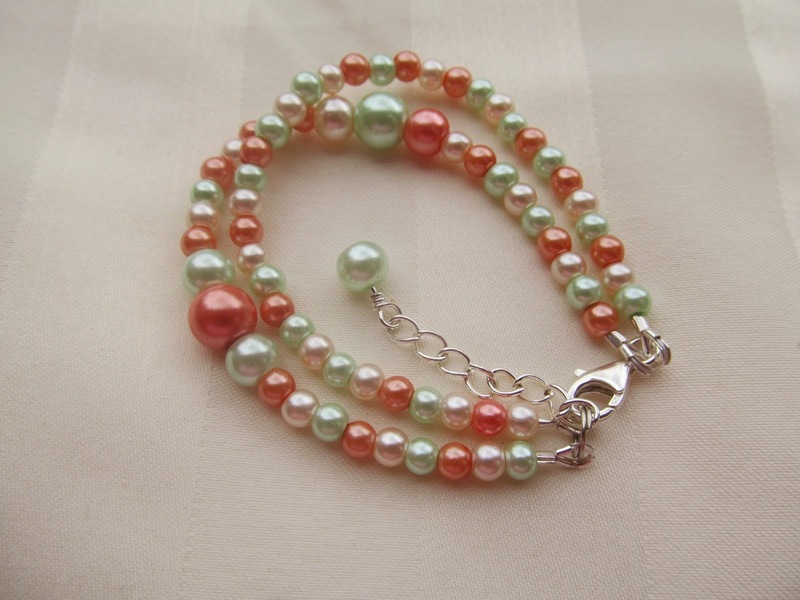 The most difficult part of this order was determining the right colors, as Shanna wanted a mint green pearl, and two shades of orange, like a coral, or lighter orange. 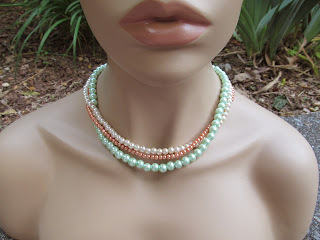 I was a little worried at first, not knowing if I would be able to find the right shades of orange and mint green that she wanted. 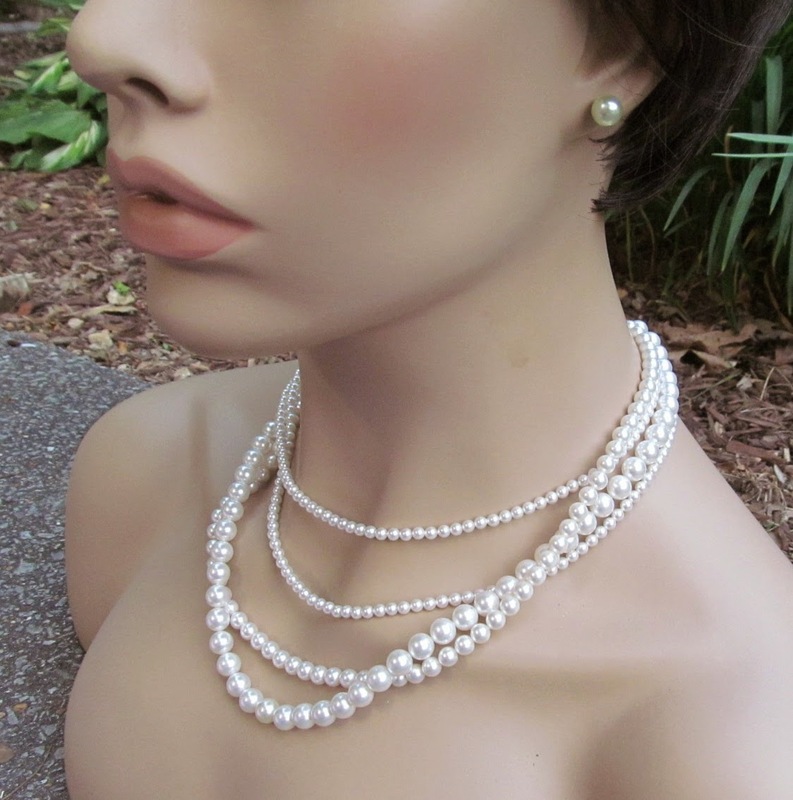 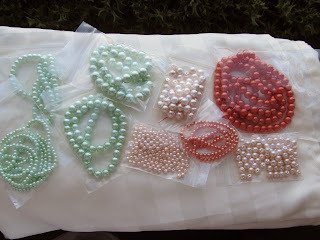 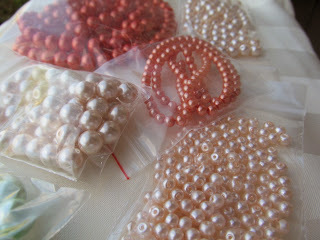 So I looked through my stash of pearls and I did have some of these pearls and then ordered more in different sizes. 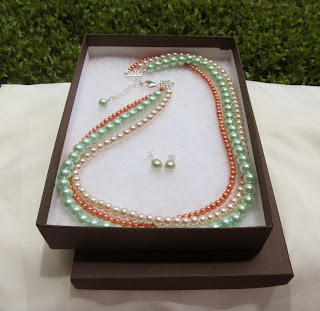 We ended up using all of the colors of pearls shown below, except for the really bright orange, shown in the upper corner in both pics below. And then, she wanted some pearl studs for her earrings. 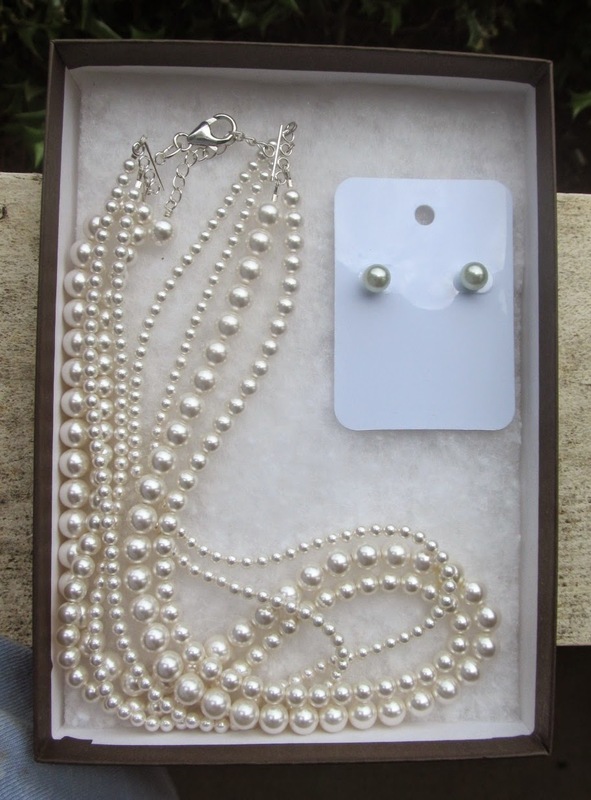 And for pearl stud earrings, the best kind of pearl to use is a half drilled pearl with a sterling silver post that has a small peg sticking out of the base, for the half drilled pearl to nicely fit in, along with some strong jewelry glue. 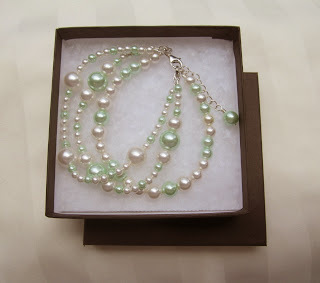 Well, fortunately, after doing some searching online, I actually found a shop in the US that had these half drilled mint green pearls, and I didn't have to purchase a minimum of 1000 pearls!! 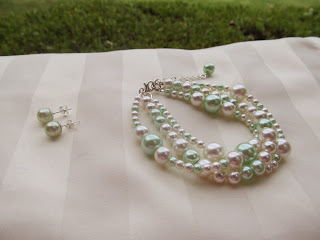 I must admit I lucked out on that scenario. 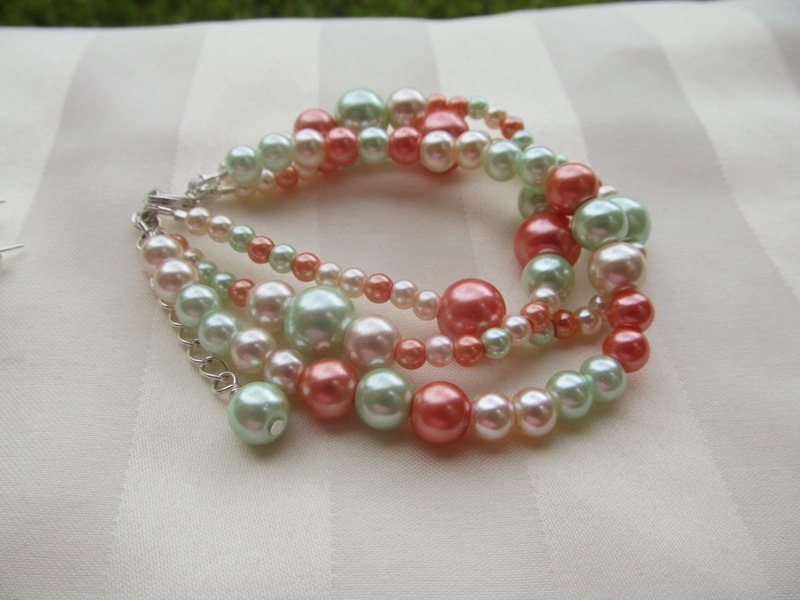 So here are some designs I put together for the bridesmaids and for the mothers of the bride and groom... First up is the 3-strand pearl bracelet, that Shanna chose for her mom, the groom's mom, and Shayla, her matron of honor, to wear. 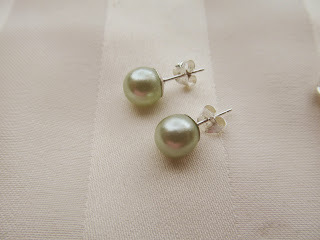 Post pearl studs with mint glass half-drilled pearls, for all members of the bridal party, including the bride... Soooo cute!! 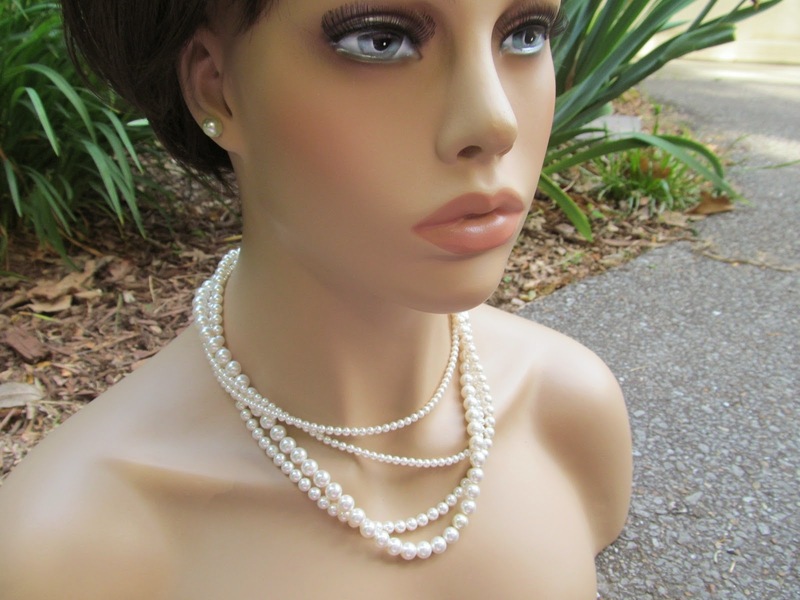 And here is the necklace that Shanna chose: a 4-strand pearl necklace made with all white Swarovski pearls, in 4mm, 6mm, and 8mm pearls... I love it!! So elegant!! The back side of the bride's necklace. 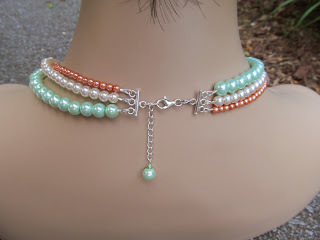 I used sterling silver 4-to-1 connectors and then an extender chain for adjusting or for a dangle in the back.